Walter De Maria (1935-2013) was a pioneering American artist associated with the Minimal, Conceptual, and Land Art movements. 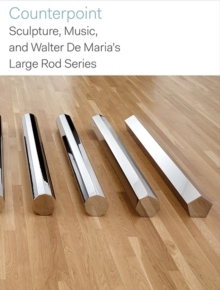 This insightful book is the definitive source on his renowned Large Rod Series, exemplary works that represent the artist's contribution to the development of Minimalism. De Maria's penchant for mathematical patterns and precise measurements can be seen throughout his oeuvre and is particularly evident in these floor-based sculptures produced between 1984 and 1989. Incorporating an analysis of De Maria's early musical compositions, this book explores a previously unexamined historical precedent in his percussion recordings and provides a new framework in which to understand the series. The inclusion of detailed artist's notes, archival photographs, and new documentation of the work's installation provide additional context for these deceptively simple works. Pages: 80 pages, 35 color + 8 b-w illus.